While the scene creates quite a spectacle with the ice littered with caps of various shapes, sizes and colors, it may pale in comparison to another toss brought on by the puck finding the back of the net. 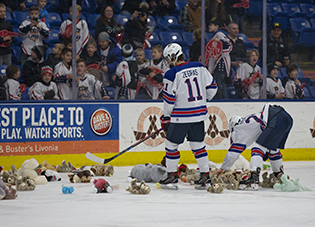 In the 25 years since its inception, the Teddy Bear Toss has become one of the greatest holiday promotions in all of sports. All it takes is one goal by the home team to set off an explosion of goodwill as cute and cuddly stuffed animals rain down from the rafters and crash to the ice where waiting attendants attempt to scoop them up with all the futility of using a coffee cup to bail water from a leaking boat. Once they are corralled, team officials whisk them away to be distributed to deserving boys and girls through toy drives and at local children’s hospitals. 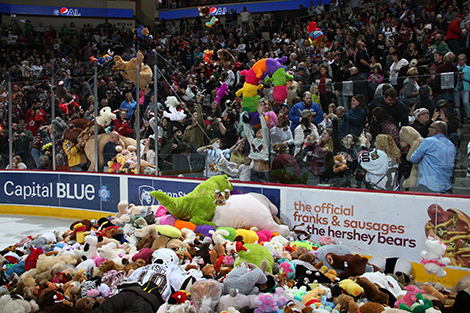 The Hershey Bears recently made headlines on Dec. 2 when Riley Barber’s goal unleashed a world record barrage of teddy bears. The AHL affiliate of the Washington Capitals collected 34,798 toys, surpassing the previous 28,815 record posted by the Calgary Hitmen in 2015. The surreal scene of a Teddy Bear Toss first took place 25 years ago when the Kamloops Blazers of the Western Hockey League executed the initial event back on Dec. 5, 1993. A quarter century later, the scene lives on throughout the hockey world, with teams from the minor leagues, collegiate ranks and Junior leagues on both sides of the border all participating in the stunning spectacle designed to collect toys to be dispersed over the holiday season. The American Hockey League has 25 teams participating in the promotion this season, while the ECHL’s involvement is equally as impressive. All 17 clubs in the United States Hockey League take part, while the college circuit has more than 20 Div. I schools joining the cause. 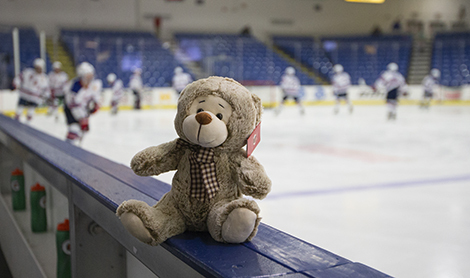 In Plymouth, Mich., USA Hockey’s National Team Development Program recently held a Teddy Bear Toss during their Under-18 squad’s clash with the University of Maine. Scoring that first goal is something that can really get the juices flowing. Players want to be that guy to tally, only to soon take cover. The Boston University commit did just that, unleashing ‘Teddy Time’ a little more than five minutes into the first period. Players are often happy to help in the clean up so that the game can resume in a timely fashion, although they do so at their own risk. Trevor Zegras and the rest of his NTDP teammates helped pick up bears at the Plymouth, Mich., based event on Dec. 7. One place where the Teddy Bear Toss hasn’t caught on is at the National Hockey League Level. The leagues cites both fan and player safety as reasons why it does not allow even the most cute and cuddly foreign objects from being tossed onto the ice. In addition, delaying the game likely wouldn’t sit well with local broadcasters. Still, it’s fun to imagine what a Teddy Bear Toss would look like at Madison Square Garden or the United Center. How many toys would be collected and distributed to kids for the holidays? The celebrations that would ensue after an Auston Matthews goal would be something to behold. Even without a Teddy Bear Toss on NHL teams’ promotional calendars, the tradition that sprung up 25 years ago is not going away anytime soon. And by the Hershey Bears’ count, the event is getting better, bigger, and fluffier every year. So it’s best to duck and cover. Those teddy bears are likely to keep coming, fast and fur-ious.